Completed in December 1941. On 19 Mar, 1942, USS Hambleton rescued six survivors from the Ceiba, which had been sunk by U-124 (Mohr) two days earlier. 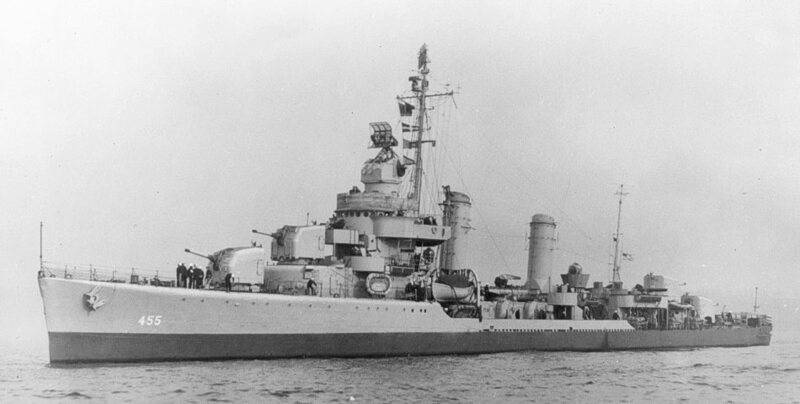 In June 1944 USS Hambleton (DD 455) took part in the Normandy landings (is credited with sinking one E-boat and one damaged) and later the landings in Southern France. Converted to High Speed Minesweeper DMS-20 on 15 November 1944.From 28 August to 20 November 1945, the minesweeper swept 184 mines in the Tokyo Bay.